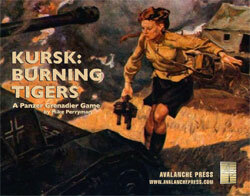 Kursk: Burning Tigers is the game topic for which the Panzer Grenadier series should have been designed. It is the perfect situation for a tank-centered tactical battle game, and so it was the perfect game with which to introduce the new Fourth Edition series rules when it debuted. Because at the heart of a game – any game - are its rules. That’s what makes it a game, by definition: not pretty graphics or cool sculpted playing pieces. Panzer Grenadier’s Fourth Edition rules set is definitely the heart of the game, distilling years of play experience into a very well-ordered package. Panzer Grenadier has become even easier to play. It’s also become a lot easier on the eyes: following the example of Panzer Grenadier (Modern), the Fourth Edition play-aids are in color. There’s also a new, far more colorful sheet of markers. A lovely package probably can’t overcome really poor rules, though there are some people much smarter than I (just ask them) who will argue that point. Still, there's no reason not to make them as attractive as possible, to increase the fun. And that’s the point: to make the game fun. Equally important in that regard are the scenarios. Mike Perryman designed them; there are 40 scenarios and curiously, there are actually a few infantry-based battles among them. Otherwise, it’s masses of tanks blazing away at each other. Some of the tank battles get pretty large, and that’s what real wargaming is all about. There’s not a whole lot of subtlety involved in most of these scenarios. This is a really fun tank-based game, just like its sister game, Kursk: South Flank. Scenario design in Panzer Grenadier is an art form; there’s no magic formula. It’s not enough to capture “what each side had,” or on the other extreme to just toss out some weak excuse about “you, the player” deciding what units you want to use (I think they call that game Magic: The Gathering). As a designer you need to present as accurate a situation as possible and most of all frame each side’s objectives in a way that places each player in the same mind-set as the commander. Mike Perryman has mastered that art. 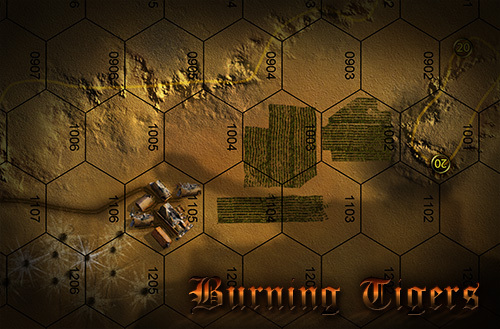 Burning Tigers plays really well, and has many of the more forgiving scenarios in the series: with so many tanks in your order of battle, you can afford to lose a few and still complete your mission. Losing one or two units isn’t usually catastrophic, since you’ve got a lot more of them. Since I’m really good at losing the most important piece on the board on the very first turn of the game, I really like the “hordes of armor” scenarios. John Stafford continues his fine run of development work; the scenarios are smooth and really show off the new rules set. With all that said, there’s still a game box filled with wonderful toys. Speaking of the box, it’s our standard 2-inch-deep black box with a very fine painting wrapped around it, by I.M. Penteshina from the Military Medical Museum of St. Petersburg. It depicts Hero of the Soviet Union Valeria Gnarovskaya, a medical orderly from the 244th Red Banner Rifle Division. Defending her aid station from the Hitlerites attempting to massacre the wounded within, she killed 28 German soldiers before throwing herself under a German tank while clutching a bundle of grenades. Inside, you’ll find a set of four maps by Guy Riessen, very similar in style and coloration to those from Kursk: South Flank. Visually, the maps from the two games make a set of eight maps – complete with a few Easter eggs hidden among the woods and villages. And then there are the pieces: silky-smooth, die-cut, with minimal impressions on the flip side. No longer do your Panthers look like they've been run over by Tigers. This makes for a great game piece. And on those near-perfect game pieces are lots and lots of tanks. The Red Army of Workers and Peasants relies on large numbers of their workhorse T-34/76, most of them the new Model C with a few of the older Model B still on hand. They also bring along T-70 light tanks, Su-122 and Su-6 assault guns, and some American-made Grant tanks provided via Lend-Lease (the so-called “Coffin for Seven Brothers”). There’s a small contingent of Soviet Guards too, mostly infantry and heavy weapons troops but bringing along some of their powerful multiple-launch rocket batteries. On the German side, this is the Regular Army’s front and the panzertruppen are at their peak. They have powerful new weapons: Tiger and Panther tanks and Elefant and Brummbär assault guns. And they have the old reliable weapons like three models of PzKpfw IV and three more of PzKpfw III, some flame-throwing tanks, the Marder III tank destroyer and of course the reliable and ever-present StuG III assault gun. And they also get the tiny “Goliath” miniature demolition tanks, to try to blow stuff up. While we waited much too long to produce Kursk as a Panzer Grenadier game, Burning Tigers really benefits from the preceding dozen years of game play and development. Panzer Grenadier is a stable, mature game system and Burning Tigers fits right into a well-defined set of artwork, game rules and established game play. New players can introduce themselves quickly to the system, while veterans can start play right away.